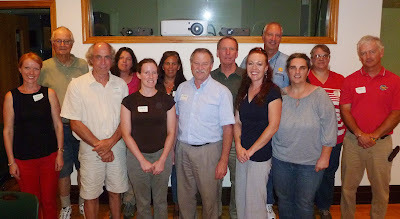 This week, the state coordinators of the Midwest Peregrine Society met at the Field Museum of Chicago. The last symposiums were held at the Milwaukee Public Museum in 1995 and 1997 (thank you to Greg Septon for this information). This meeting was an opportunity for some of the folks involved with the original reintroduction plans to reconnect, as well as for more recent folks to meet and hear the history of the project. These passionate, committed people work in each of their states/areas to band each season’s peregrine chicks, conduct field surveys, and educate and connect with the public and nest site personnel, among many of their efforts. This meeting was a combination of past, present and future knowledge and expertise all together in one room. Topics of the meeting included future plans and goals, and new developments in areas of technology and possible research/study. Brian Ratcliff, of Project Peregrine (Ontario), graciously phoned in to share the history and current plans for the province. The group also recognized and remembered Dr. Harrison (Bud) Tordoff. 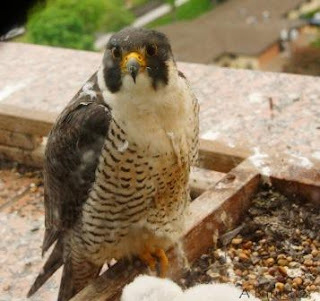 It was Bud's vision and ambition in the late 1970's that promoted the idea that we could and should begin the effort to restore peregrines to the Midwest. Under his leadership and with his inspiration, the Midwest Peregrine Society evolved and resulted in the release of almost 800 peregrines, and the establishment of a self-sustaining population some four to five times that of anything known historically. TRC staff provides leadership, technical advice and administrative support for the Society. A history of the restoration project, as well as a searchable database for the public to look up individual birds, sites and state information, is here. Photo of group: Back row, L to R: John Will, Grand Rapids, MI; Amy Ries, Raptor Resource Project; Jacquelyn Fallon, Midwest Peregrine Society; Greg Septon, Wisconsin FalconWatch; John Castrale, Indiana Division of Fish and Wildlife; Karen Cleveland, Michigan Dept. of Natural Resources. Front row, L to R: Jennifer Norris, Ohio Dept. of Natural Resources, Division of Wildlife; Pat Schlarbaum, Iowa Department of Natural Resources; Kathryn Heyden, Kentucky Dept. of Fish and Wildlife Resources; Patrick Redig, Midwest Peregrine Society; Amber Burnette, Midwest Peregrine Society; Mary Hennen, Bird Division, The Field Museum; Jeff Meshach, World Bird Sanctuary (MO). 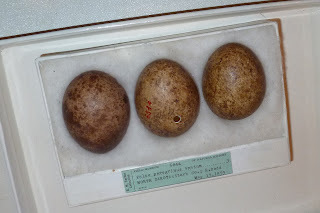 M Hennen brought out eggshells collected in ND from 1899.